I've been playing Minecraft since August of 2010 - since it was in alpha (first testing mode). I adore this game. What is Minecraft, you ask? Well, it's essentially Legos, on your computer, with the mystery and excitement of exploring as the world randomly generates around you. You have to harvest all the blocks you want to use, and then you BUILD ALL THE THINGS. It's also like Knex in that you can use "redstone" to build electrical circuits to power devices in the world - I've made working showers inside my lodge (flip a switch and water pours out), a portcullis that raises and lowers at the touch of a button, and more. One of the most brilliant things about this game, too, is that there are monsters that you can toggle the difficulty of on and off at any time. I usually play on "peaceful" mode - with the monsters turned off - but if I decide I want to build some armor and be wary of my surroundings for a different kind of game, I can turn the monsters immediately back on. The game also continually comes out with updates. Mojang (the indie game company that started with Minecraft) is still adding to it! The game has changed drastically since I started playing. I tend to play obsessively for a couple weeks or months, and then not play for several months (lurking around the SubReddit for ideas). Unlike anyone else I've spoken to, I've essentially played in the same world since starting. My world is called "World2" - it's the second world I ever launched in Minecraft, 3.5 years ago. Every time I give someone a tour (which takes at least a half hour now), I get amazement. 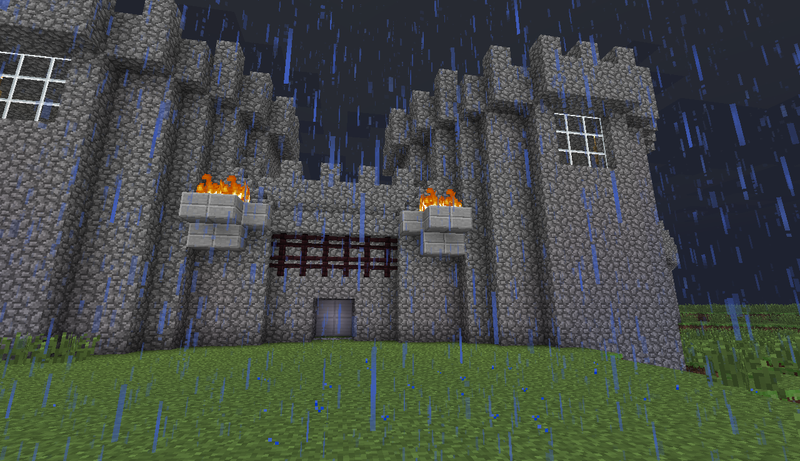 :) I've never actually posted any pictures of my builds, though. This is going to change, starting with this overview post. As you might expect, World2 is huge. 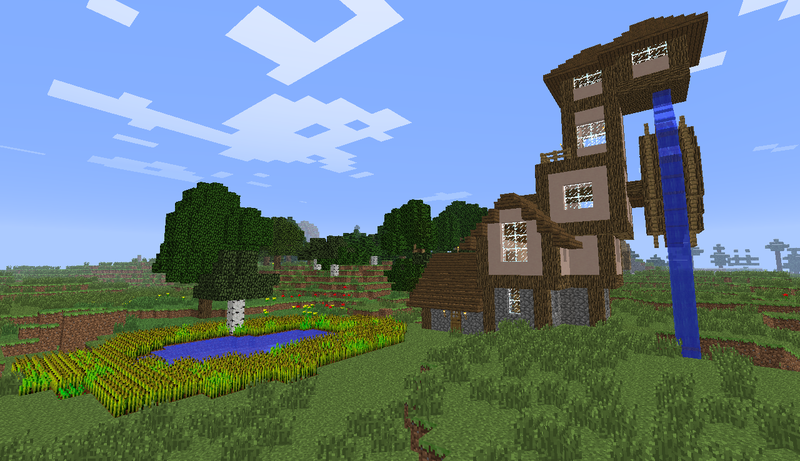 I've played "vanilla Minecraft" since starting - that is, without any mods. Mojang allows the gaming community to make mods that change game play (lets players fly, or adds tons of different blocks, etc - no limit to the imagination of mod creators), but I've never played with any of them. My joy in Minecraft is being able to say that I have built it all myself, block by block, mining all the resources and doing it the long way. There are a couple exceptions to this. The first is obvious from the image above - I love using map-makers. 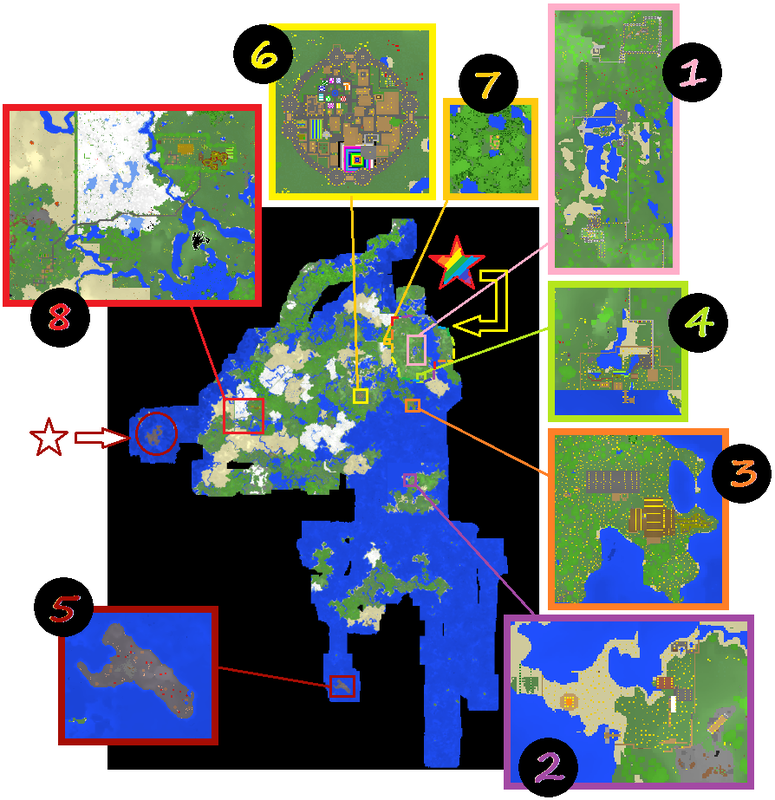 It makes it easier to design minecart travel systems through the Nether (an alternate dimension in Minecraft that is quicker to travel through) when I can count distance by mapping my world, and also means I can find where I am if I get lost exploring. The Minecraft Wiki has a lovely synopsis of Mappers. The one I'm currently using is MCAMAP. I still miss Cartograph G - if anyone out there wants to update that so it's compatible with the current Minecraft updates, I would be so happy with you! The second big exception involves the island with the box labeled #2 on it in the picture above. I didn't decide that I only wanted to play in one world until the beginning of 2012. I had built almost all of my best work in World2, but I had this lovely island with a lighthouse, several houses, and a mob grinder on it in another world. I used MC Edit to drop that island into the middle of the open ocean in World2. Other than that, I have not edited my world at all, though this might change soon. That entire bottom section of the map covered in ocean (below #2)? That was all to find a Mooshroom Island - block #5. I found it at the end of 2011 after spending several very boring days traversing back and forth over the ocean. Now, though, there are a lot more biomes in Minecraft, and I want to be able to explore to find them, and all that ocean is really boring and taking up data space. I am contemplating cutting off the entire bottom half of the map with MC Edit (or similar program) so I can explore the new biomes more. Plus, I just found another Mooshroom Island (circled, with a star pointing to it, on the left side of the map) a couple days ago. This one is much closer to everything else. Before I do this, though, I want to document the giant minecart system I made to get to that Island, so it probably won't be destroyed until I finish writing up posts about it here.